What is Blue Buffalo Wilderness Kitten Food? Modeled with the diet of your kitten's wild cousin, the lynx, in mind, Blue Buffalo Wilderness Dry Kitten Food features a high concentration of protein-rich chicken to keep your little hunter feeling playful and spry. With the added boost of LifeSource Bits to keep the immune system going strong, Blue Buffalo Wilderness Dry Kitten Food is formulated especially for all of your growing kitten's needs. Meat-rich Blue Buffalo Wilderness Dry Kitten Food is a tasty natural food your pet will love. Blue Buffalo Wilderness Dry Kitten Food was developed especially to meet the complex nutritional needs of your kitten. With protein, DHA, and essential vitamins, this natural kitten food is formulated to support your kitten's healthy growth. Talk with your veterinarian about how much food is best for your growing kitten. If your kitten has any special dietary requirements, also discuss with your veterinarian before feeding any new food. Open the package of Blue Buffalo Wilderness Dry Kitten Food. Gently shake or scoop the desired amount of natural kitten food into a clean dish. Offer the dish to your kitten. Clean up any unwanted food promptly to prevent spoilage. Monitor your kitten's growth to be sure he or she is receiving the correct amount of food. 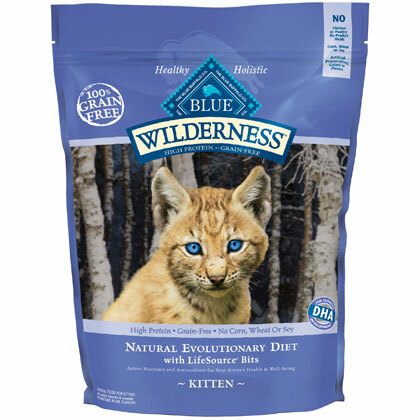 Blue Buffalo Wilderness Dry Kitten Food is gluten-free and can be used as a nutritionally complete alternative to expensive and inconvenient raw cat food diets. Ingredients: Deboned Chicken, Chicken Meal, Turkey Meal, Potato Starch, Fish Meal (source of Omega 3 Fatty Acids), Fish Oil (source of DHA-Docosahexaenoic Acid), Peas, Chicken Fat (preserved with Mixed Tocopherols), Flaxseed (source of Omega 3 and 6 Fatty Acids), Natural Chicken Flavor, Potatoes, Potato Protein, Sunflower Oil (source of Omega 6 Fatty Acids), Alfalfa Meal, Whole Carrots, Whole Sweet Potatoes, Cranberries, Blueberries, Barley Grass, Dried Parsley, Dried Kelp, Taurine, Yucca Schidigera Extract, L-Carnitine, L-Lysine, Turmeric, Oil of Rosemary, Beta Carotene, Vitamin A Supplement, Thiamine Mononitrate (Vitamin B1), Riboflavin (Vitamin B2), Niacin (Vitamin B3), d-Calcium Pantothenate (Vitamin B5), Pyridoxine Hydrochloride (Vitamin B6), Biotin (Vitamin B7), Folic Acid (Vitamin B9), Vitamin B12 Supplement, Calcium Ascorbate (source of Vitamin C), Vitamin D3 Supplement, Vitamin E Supplement, Iron Amino Acid Chelate, Zinc Amino Acid Chelate, Manganese Amino Acid Chelate, Copper Amino Acid Chelate, Choline Chloride, Sodium Selenite, Calcium Iodate, Salt, Caramel, Potassium Chloride, Dried Yeast (source of Saccharomyces cerevisiae), Dried Lactobacillus acidophilus fermentation product, Dried Bacillus subtilis fermentation product, Dried Enterococcus faecium fermentation product. Nutrition Statement:BLUE Wilderness Chicken Recipe for Kittens is formulated to meet the nutritional levels established by the AAFCO Cat Food Nutrient Profiles for growth. For best results, keep in an airtight container at room temperature. Be sure to remove any portion of dry cat food your pet does not eat.